We're an indie game studio based in Hobart, Tasmania. In October, the Myriad team travelled over to the mainland to experience the wonder that is Melbourne International Games Week (MIGW). We attended GCAP, numerous networking events, and spent some time at PAX (with some team members opting to Enforce this year). As a studio we set out some goals beforehand, and during the course of the week we worked towards achieving these goals. MIGW can be intense – the sheer number of events, new people, and information to absorb is overwhelming, and it’s easy to become run-down and spent well before the week is over. This year for us, MIGW was all about learning our physical and emotional limits to make sure we could get through the week – and here are some of the most useful things we learned along the way. Everyone has different limits, so try to plan ahead and talk openly with your team – no one should be in a position where they feel obligated to attend social/networking events. We discovered everyone on our team has different strengths – some were good at networking and making initial connections, whereas others were better at reinforcing existing connections. Knowing this, we could spend our time at events that suited our strengths, rather than attending every single one – this allowed us to chill out when we needed to. Think of your social energy as a fuel tank; attending events drains that tank and once it’s empty your ability to socialise and recover will deteriorate. You need to be able to recognise when your tank is close to empty, and decide when it is best to recharge rather than staying out late and regretting it in the morning. Everyone has different limits, so try to plan ahead and talk openly with your team – no one should be in a position where they feel obligated to attend social/networking events. If you’re going solo, don’t set your expectations too high – create a realistic goal for yourself and prioritise events that actively work towards that goal. Learn to understand when you are too exhausted to attend that next social event and plan chill time instead. So much of what we learn is from what others have to tell us, so take the time to listen. ‘Networking’ is something that makes everyone cringe when you say the word. It conjures images of corporate events, elevator pitches, suits and exchanging business cards. It doesn’t have to be that way (except for the business cards – those are good!). Instead of looking for ways to ‘build your network’, just focus on meeting new friends who share your passion. We have heard this numerous times, but it really seemed to sink in this year – making friendships leads to more fulfilling relationships as opposed to just business connections. Changing your expectations and the way you approach things can be the key to getting over your personal ‘mountain’ when it comes to networking. Everyone has a story – be interested in what they have to say and what they’re working on. Ask questions! So much of what we learn is from what others have to tell us, so take the time to listen. Be a good friend, look out for each other and the ‘networking’ will happen all by itself. The best part about the games industry in Australia is that it’s amazingly inclusive – this happens from creating a comfortable and safe environment for all involved. Social events can be uncomfortable for heaps of reasons. We are all different and unique in our own ways and that includes how we react to social environments. It can be extremely difficult to spot when someone is uncomfortable within a situation (be it the environment itself or a social interaction). If someone appears uncomfortable, ask if they’re okay. If they want to leave, don’t try and stop them but maybe offer some company or make sure they can get home safely. Most importantly, if you see or hear something that doesn’t seem right, speak up. You don’t have to confront them directly, speak to a friend or a mentor and together we can help each other. 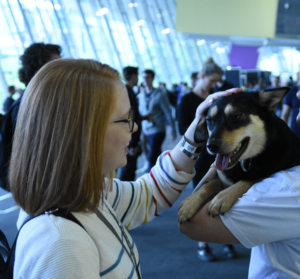 The best part about the games industry in Australia is that it’s amazingly inclusive – this happens from creating a comfortable and safe environment for all involved, and the first step to being a part of that community is fostering its inclusiveness. MIGW is an amazing week, full of valuable talks, motivating keynotes, and socialising opportunities.A big thank you to Screen Tasmania and the GDAA for supporting us, so the whole team could make it along this year. Sharing lessons in a supportive environment is one of the best things about this industry, and we are grateful that we were able to attend. We learned our limits, and how to work within them – making friends, helping others, and making sure we still had time to chill out and have a cup of tea.